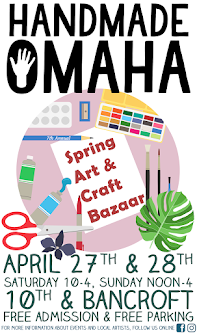 Rachel O's Fabulous Whimsy is bringing all the fabric button jewelry, hand-painted wood ornaments, jackalope and NEW acrylic dangle earrings you can handle to the Handmade Omaha Winter Art & Craft Bazaar November 24th and 25th at 10th and Bancroft! With over 300 different fabric button designs available in earrings, hairpins, and pendants, she'll have stocking stuffers for everyone on your list. Rachel is bringing ornaments like you've never seen before. Spot the Mistle-TOE in the photo? Every jackalope will be sent home with a Santa hat to celebrate the season. Dangle earrings GALORE to decorate your lobes and those of your loved ones through till 2019. These laser cut acrylic earrings are NOT to be missed!